Malibu Premium Linen is triple sized and primed by hand with a unique alkyd primer made to resemble lead-based grounds without the hassle and toxicity of lead. It weighs roughly 13 oz. after priming, and offers an extraordinarily stable surface to paint with your oil-based colors. This optimal ground tends to absorb the paint, thereby creating depth and dimensionality to your art. 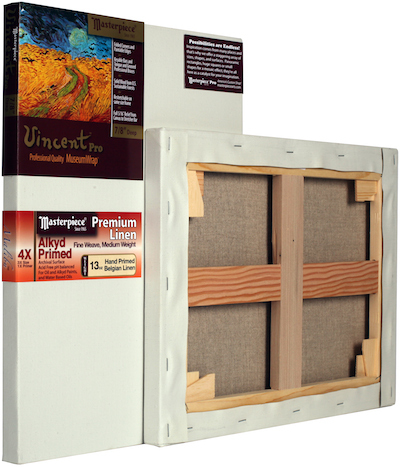 Vincent Pro stretched canvases feature a 7/8" profile with a 5/16" lip that keeps the canvas surface positioned high above the bars to prevent lines and indentations. The key-able cross bracing on sizes 16" × 16" and up offers additional strength, stability and warp resistance. Stretched using MasterWrap technology, this canvas offers a drum-tight, archival surface that can be further adjusted using the pre-installed corner and brace keys. Folded corners and extra canvas selvage allow for re-stretching, and the clean staple free edges are great for display without a frame. The solid, finger-joint free, kiln-dried bars are milled with lumber harvested from sustainable forests in both Oregon and California.